Along with servers and networking infrastructure, networked storage is one of the fundamental components of a modern data center. Because storage networking has evolved over the past two decades, the industry has settled on the basic storage networking technologies. These technologies are Fibre Channel (FC) storage area networks (SANs), Internet Small Computer System Interface (iSCSI)-based Ethernet attachment, and Ethernet-based network-attached storage (NAS). Today, lossless, low-latency, high-speed FC SANs are viewed as the high-performance option for networked storage. iSCSI and NAS are viewed as lower cost, lower performance technologies. The advent of the 100 Gbps Ethernet and Data Center Bridging (DCB) standards for lossless Ethernet give Ethernet technology many of the desirable characteristics that make FC the preferred storage networking technology. These characteristics include comparable speed, low latency, and lossless behavior. Coupled with an ongoing industry drive toward better asset utilization and lower total cost of ownership, these advances open the door for organizations to consider consolidating and converging their networked storage infrastructures with their Ethernet data networks. Fibre Channel over Ethernet (FCoE) is one approach to this convergence, but 10-Gbps-enabled iSCSI also offers compelling options for many organizations with the hope that their performance can now rival that of FC. This IBM® Redbooks® publication is written for experienced systems, storage, and network administrators who want to integrate the IBM System Networking and Storage technology successfully into new and existing networks. 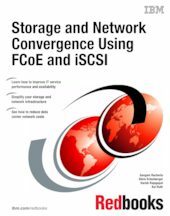 This book provides an overview of today's options for storage networking convergence. It reviews the technology background for each of these options and then examines detailed scenarios for them by using IBM and IBM Business Partner convergence products.